The Society of Japanese Aerospace Companies and Tokyo Big Sight Inc. are now welcoming applications for media interviews for the Japan International Aerospace Exhibition 2016, to be finally held from Wednesday 12th October, 2016, at Tokyo Big Sight. The Society of Japanese Aerospace Companies and Tokyo Big Sight Inc. are proud to announce that the public event program has been finalized for the Japan International Aerospace Exhibition 2016 (JA2016), to be held over four days from Wednesday 12th to Saturday 15th October, 2016, at Tokyo Big Sight (3-11-1 Ariake, Koto-ku, Tokyo). The Society of Japanese Aerospace Companies and Tokyo Big Sight Inc. are now welcoming applications for media interviews for the Japan International Aerospace Exhibition 2016, to be held over four days from Wednesday 12th to Saturday 15th October, 2016, at Tokyo Big Sight. Materials scientists at Japan&apos;s Kyoto University investigated the properties of various compositions of molybdenum silicides, with and without additional ternary elements. The Society of Japanese Aerospace Companies and Tokyo Big Sight Inc. are proud to announce the commencement of advance registration, admission ticket sales, and advance registration for seminars at the Japan International Aerospace Exhibition 2016, to be held over four days from Wednesday 12th to Saturday 15th October, 2016, at Tokyo Big Sight. Ryoju Cold Chain Co., Ltd. (RCC, CEO: Norio Ando, HQ: Chiyoda-ku, Tokyo) of the Mitsubishi Heavy Industries, Ltd. (MHI) Group will establish a sales and after-sales service company for truck/trailer reefers in Thailand from October this year. Mitsubishi Heavy Industries, Ltd. (MHI), jointly with Mitsubishi Corporation (MC), has received an order for capacity expansion work and the provision of new cars for the Automated People Mover (APM) system at Singapore Changi Airport. More than 120 international experts will be present in Kuala Lumpur for the ASEAN Power Week to present and discuss various issues in the power generation industry, focusing on strategic and technical power issues and challenges, the continued growth of the renewable and alternative energy sectors and the financial marketplace within power generation. Returning to occupy an impressive 36,000 square metres of exhibition space at Singapore&apos;s Marina Bay Sands from 2 to 5 December, OSEA is currently priming itself to play host to more than 1,600 exhibitors and 28,000 trade attendees from 45 countries/regions. As many countries seek solutions for the urgent problem of water scarcity, governments, businesses and water experts from around the world will be gathering in Abu Dhabi from 15-17 January 2013 in an effort to provide tangible solutions on water sustainability. Mitsubishi Heavy Industries, Ltd. (MHI) has received a full-turnkey order from Gulf JP UT Company, Ltd. (GUT) for the construction of a 1,600MW (megawatt) gas turbine combined cycle (GTCC) power generation plant (two blocks of a 800MW power generation unit) in Thailand. Mitsubishi Heavy Industries, Ltd. (MHI) has agreed with China Huadian Electric Research Institute (CHDER) of the China Huadian Corporation (CHD) to collaborate in promoting a natural gas-fired distributed generation system business in China and signed MOU. Singapore International Water Week (SIWW) 2012, held from 1 - 5 July and themed "Water Solutions for Liveable and Sustainable Cities", achieved a new record of S$13.6 billion in total value for the announcements on projects awarded, tenders, investments and R&D MOUs made at the event. Mitsubishi Heavy Industries, Ltd. (MHI) and PUB, Singapore&apos;s national water agency today signed a Memorandum of Understanding (MOU) to collaborate on the research and development of integrated water infrastructure system for used water treatment and reclamation. Mitsubishi Heavy Industries, Ltd. (MHI) signed a memorandum of understanding (MOU) today with Singapore&apos;s national water agency, PUB to collaborate on the development of advanced technologies for water treatment and reclamation. A consortium made up of Marubeni, the University of Tokyo, Mitsubishi, Mitsubishi Heavy Industries, IHI Marine United, Mitsui Engineering & Shipbuilding, Nippon Steel, Hitachi, Furukawa Electric, Shimizu and Mizuho Information & Research are participating in an experimental offshore floating wind farm project sponsored by the METI. Mitsubishi Heavy Industries, Ltd. (MHI) and Anupam Industries Limited (Anupam) of India have jointly established Anupam-MHI Industries Limited, a company to manufacture heavy-duty material handling equipment, including quayside container cranes, in India. MHI aims to further enhance its response to the needs of India&apos;s rapidly growing power generation market and to expand orders from India for its power systems products, including gas turbine combined cycle (GTCC) power generation plant and its component. Mitsubishi Heavy Industries, jointly with APEX Energy Sdn. Bhd. of Malaysia, and PT Rekayasa Industri (REKIND) in Indonesia, has received an order from PETRONAS Chemical Fertilizer Sabah Sdn. Bhd. (PCFSSB) for a project to construct a large-scale ammonia/urea fertilizer plant. 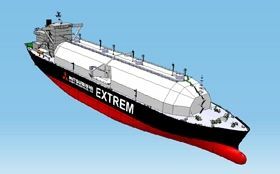 Mitsubishi Heavy Industries, Ltd. (MHI) has completed development of a new-generation liquefied natural gas (LNG) carrier marking an evolutionary advance from Moss-type LNG carriers. Mitsubishi Heavy joiand ITOCHU received an order from the Transportation Infrastructure Office (GIT) of Macau to supply rolling stock and E&M systems for Phase I of the Macau Light Rapid Transit (MLRT) system. Hangzhou Steam Turbine & Power Group Co., Ltd., (HTP), of China, a licensee of compressor technology of Mitsubishi Heavy Industries Compressor Corporation (MCO), a subsidiary of Mitsubishi Heavy Industries, Ltd., (MHI), has completed its sales structure of compressors in the Chinese market and begun its marketing. On October 22nd, a consortium of thirteen Japanese companies will join hands to establish "International Nuclear Energy Development of Japan Co., Ltd. (JINED)". Mitsubishi Heavy Industries, Ltd. (MHI) will install testing equipment for two-stroke, low-speed marine diesel engines at the company&apos;s Kobe Shipyard & Machinery Works in Hyogo, Japan. Mitsubishi Heavy Industries, Ltd. (MHI) will establish MHI Industrial Engineering & Services Private Ltd. (MIES) in Singapore effective October 1, which will handle the company&apos;s machinery and steel structures business. Vietnam Shipbuilding Industry Corporation (VINASHIN) has completed production of its first Mitsubishi-UE low-speed marine diesel under a technology licensing arrangement with Mitsubishi Heavy Industries, Ltd. (MHI). Mitsubishi Heavy Industries, Ltd. (MHI) and Zhejiang Yungpu Heavy Machinery Co., Ltd. (YUNGPU) in China&apos;s Zhejiang Province have agreed last December on licensing of the technology incorporated into the Mitsubishi-UE, MHI&apos;s low-speed marine diesel engines. Mitsubishi Heavy Industries, Ltd. (MHI) is about to launch local production of rubber tire production machinery in China with the establishment of a wholly owned subsidiary, Changshu Ryoju Machinery Co., Ltd. in Changshu, Jiangsu. Mitsubishi Heavy Industries, Ltd. (MHI) has reached an agreement with Pebble Bed Modular Reactor (Pty) Ltd (PBMR Pty) of the Republic of South Africa to study the area of collaboration in the development of the "Pebble Bed Modular Reactor" (PBMR).